Dr. Steve Murphree, professor of biology and entomologist, gave a presentation titled “Insects & Disease in the War Between the States” to the Dr. J. B. Cowan Camp #155 Sons of Confederate Veterans in Tullahoma on July 14. A few days prior, Murphree was a “Science of History” camp leader for insects and wildlife at The Historic Sam Davis Home and Plantation. The camp focuses on the plantation’s natural resources and features engaging, hands-on activities designed to inspire campers to take a closer look at the world around them. Activities for the event include a creek stomp, meadow safari and getting an insider’s view on Tennessee’s wildlife. 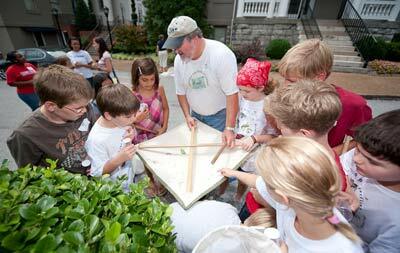 During June and July, Murphree has been hosting his Beetles, Bugs and Butterflies Summer Day Camps for elementary school children at Cheekwood Botanical Garden and Museum of Art. During Wednesdays, the campers enjoy an interactive “Bug Day” with Murphree to learn about insects in the garden during Nature Explorers camp. Murphree was recently interviewed by Ms. Cheap (Mary Hance) in her Tennessean column about the “Insects of the Night” program held at Warner Park Nature Center on Friday, July 17. Murphree will be giving an introductory presentation at the event and will help with a variety of stations.